Religious Exploration for children and youth is a place where we create a welcoming spiritual home, which provides safe spaces and loving circles that foster playfulness, inquisitiveness and diverse relationships while building an awareness of self, social justice, and a desire for transformative action in our world. We want to know all about YoUU and your children! 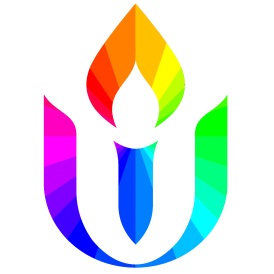 It is the policy of the Boise Unitarian Universalist Fellowship (BUUF) that all children and youth, nursery through high school, attending at least three times during the program year (Sept – June) or any BUUF-related programs (e.g. Our Whole Lives human sexuality course or Coming of Age) be registered in Religious Exploration. Want to learn more about KidCheck? Parents and guardians, please click here to watch an introductory video. Meanwhile, parents and guardians can go to the KidCheck website here and then watch a how-to video for creating their profiles – the required first step to this online registration/check-in process. Thank you! The apps for smartphones that you can download for ease of creating your family’s profile, and signing in on Sundays. We appreciate the support that all families with children participating in religious exploration give through our registration fees and in many other ways. We are aware that every family has different financial circumstances so our registration fees are $0-$30 per child, with a $75 maximum per family. Click the link below to make a donation towards religious exploration. Thank you for your gifts of time, talent, and treasure!